Although an Alice in Wonderland theme may sound a little childish, don't let the title fool you! This theme leads the way for an incredibly elegant and fancy wedding! When choosing color schemes, you'll have two that can go with. The first is whimsical pastels like blue/pink/green/yellow. The second caters more to the Queen of Hearts from Alice in Wonderland and is red/white/black. You might have an easier time finding all of the accessories for your wedding if you choose red/white/black, but the whimsical colors are more true to the fairy tale feeling. If you choose the whimsical colors, your invitations can simply be based upon those colors. If you are willing to get your invitations custom made, you could also go with a "tea party" theme that the Mad Hatter would love! If you choose the red color scheme, there are plenty of playing card wedding invitations out there that would suit the Queen of Hearts. Your dress is really left up to personal taste with this fanciful wedding theme. David's Bridal does have a wedding gown that I feel really captures the essence of the Alice And Wonderland Theme, though. It is style 9T9250 and a variety of color trims are available, so it could fit with either color scheme. The clothing for the rest of your wedding party can be simple and classic, or you can go crazy with the theme and have all the men wear top-hats like the Mad Hatter. towers of pastel colored petit fours. If you have chosen the red color scheme, your decorations should be denominated by red roses. If you can afford it, and Alice in Wonderland ice sculpture would be fitting for both color schemes. Use a classical version of Alice in Wonderland for the sculpture, instead of the Disney cartoon we usually associated with the fairy tale. The cake is the real highlight of this wedding! The cake for your wedding is what I built this entire theme around, and it's called a Whimsy Cake. The cake features tilted layers, rolled fondant icing, and whimsical touches that are fit for any fairy tale. Most bakers have the equipment available to make this cake, and it can be done in either color scheme. The Whimsy Cake is the perfect treat for your fantasy wedding! Your wedding favors will again depend on the color scheme you have chosen. For the whimsical theme, you can give your guests gourmet tea bags with decorated cookies. An alternative to the edible favor is petit four candles, adorable yet inedible! The candles can be found to match both color schemes. For the red color scheme, personalized mini-playing cards are a great option! Choosing an Alice in Wonderland wedding theme really gives you a lot of room for personalization. If you do not like the ideas I have listed here, there are certainly many that you can come up with on your own now that I've given you the theme-idea! No matter what special touches you use to make your wedding special, it's bound to be fit for a fairy tale when the theme is Alice in Wonderland! 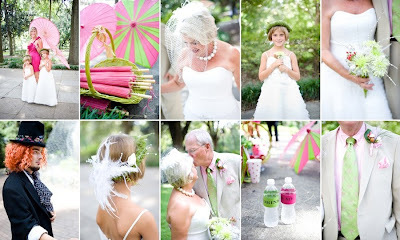 Anda sedang membaca artikel Unique Wedding Themes : Alice in Wonderland. Artikel ini dapat ditemukan dengan url http://alicewonderlandstories.blogspot.com/2011/02/t-is-getting-hard-to-plan-wedding-that.html. Anda boleh menyebarluaskan atau mengcopy artikel-artikel di alice in wonderland ini jika memang bermanfaat bagi bagi orang lain, tapi jangan lupa untuk mencantumkan link sumbernya... terima kasih ! Jangan lupa klik tombol facebook LIKE di bawah ini ya.